The Yam Bean, also called Jicama, or Mexican turnip, comes from Central America, but has become a popular ingredient in Asian cuisine. Although related to the soy bean and classed as a legume, it looks more like a potato, but can be used as a fruit. It is most often cut into strips and eaten raw, but can also be dried and ground into flour to make cakes and pastries. Using the Yam Bean and a few other ingredients, it makes a tasty and nutritious fruit salad. Wash, peel and cut the yam bean and other fruits into small square pieces. Mix the fruit pieces and cherry tomatoes in a bowl, cover, and place in the refrigerator for about 30 minutes. To make the dressing, mix together the mayonnaise, condensed milk, yogurt, and lemon juice or vinegar. Cover and place in the refrigerator to cool. 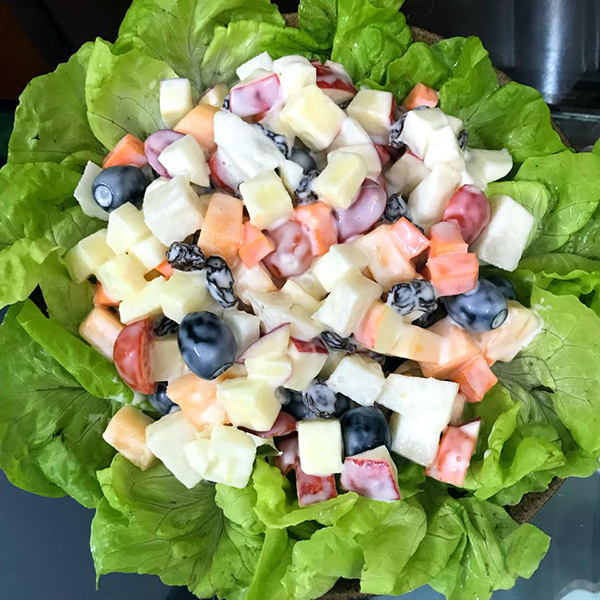 When you want to enjoy the salad, mix the dressing into the fruit salad and add raisins. Yam Bean Fruit Salad Rating: 4.5 / 5 stars from 1 votes.